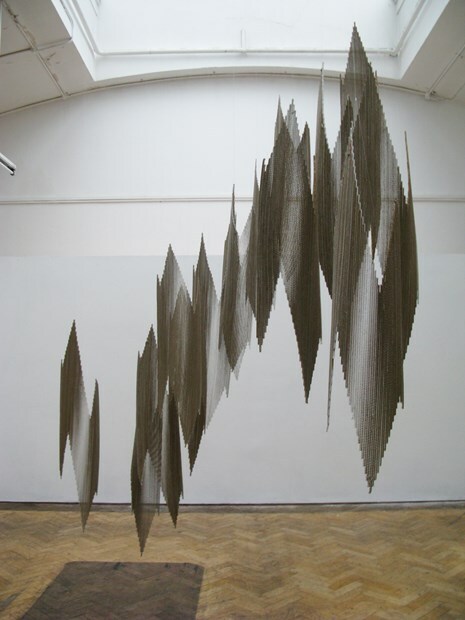 Jan Blake's work is imbued with a fascination for movement and the transformative powers of light. 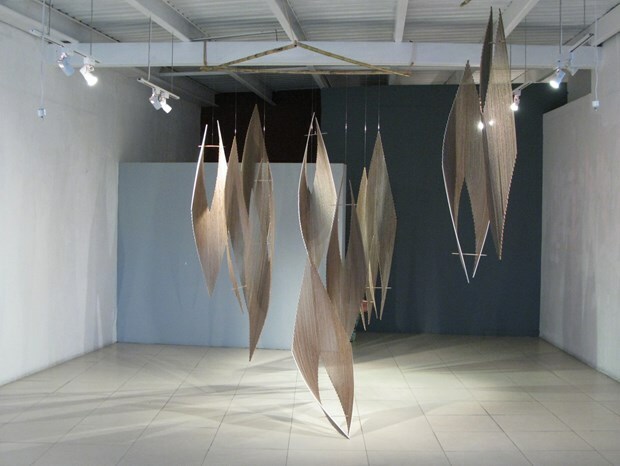 Influenced by her work as a theatre designer for dance and physical theatre in particular, she has developed these 'Aerial sculptures' for public spaces. The initial concepts and imagery for the majority of her work is taken from the natural world. She is drawn to the duality of beauty and violence inherent in nature: the tension created by light between sky and sea before a storm; a pod about to disperse its seeds and waves sucking and dragging pebbles and debris back into the sea. This duality is reflected in her smaller personal works (see The Three Graces). Journeys both real and imaginary are also a recurring theme. The architectural space and the people that circulate around it daily, informs her initial thoughts like a 'script' for a play. This connection of the work to the building is vital to the success of her projects for public spaces. The research for these public art projects is an integral and vital part of the process. This includes dialogue and presentation of ideas to members of an arts team for the commission. 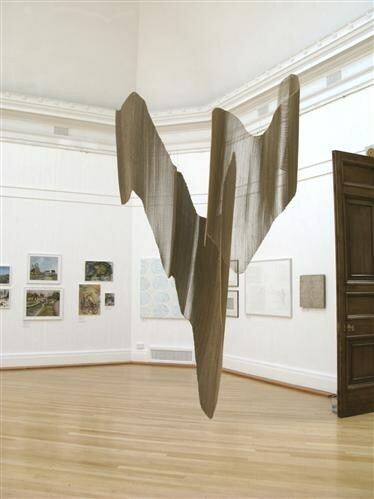 All the aerial sculptures start as scale models that are then transformed into full scale works for public spaces. 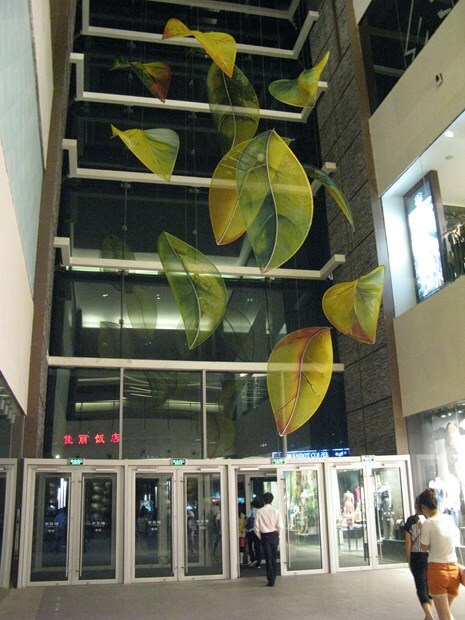 The finished piece is usually a collaboration between metalworkers, fabricators such as kite and sail makers, installers and sometimes glass makers. For many years she has been using silk organza painted with procion dyes for the majority of her commissions and personal work. 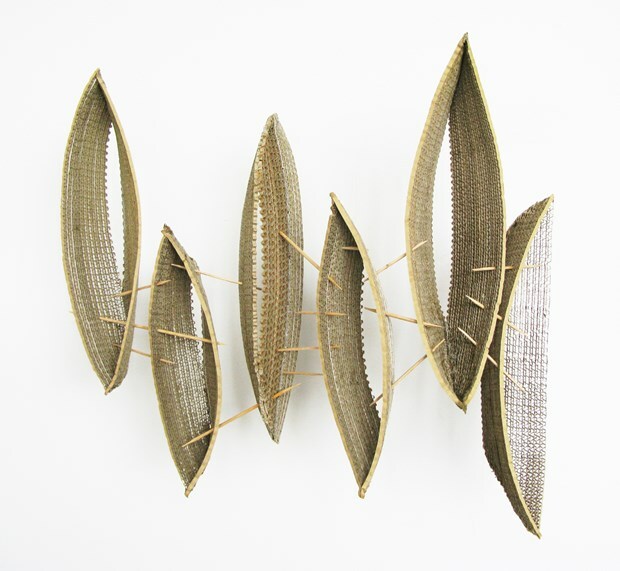 During recent years she has been exploring cardboard to create moving structures that appear almost transparent. The influence of printmaking is evident in the marks she uses on the silk. The economy of line and form comes from a lifelong admiration of Japanese and African art and culture. This links well with her love of movement and illusion that draws directly from theatrical influences and experience of designing for dance. A life changing course run by Jacques Lecoq in 1990 in Glasgow looking at the relationship between movement, space and sculptural form was a great influence :also following classes of Feldenkrais "Awareness through movement" regulary for the past 20 years. She trained as a specialist art teacher at Bath Academy of Art Corsham, Wilts and then taught in secondary schools for nine years before taking a post graduate course in Theatre Design at the Slade School of Fine Art, London. 1981 - Arts Council Award for Theatre Design. She spent a very successful twelve years working as a freelance designer for, drama, ballet, contemporary dance and opera in prestigious theatres internationally. Namely Flowers of the forest and Gallantries choreographed by David Bintley for Birmingham Royal Ballet and The Royal Ballet. In 1994 she moved to Bristol to spend more time on her own work and to evolve the work for public spaces. She has taught throughout the UK and given talks about her work as an artist internationally. Future projects include; Continuing personal research into new materials for use in hospitals and in her own personal work and open to further commissions and collaborations with other artists of different disciplines. In 2015 she was invited by Creativity Works and Fresh Arts to work with people recovering from mental illness and their carers in three museums in Bath culminating in an exhibition of their work in Bath Artists Studios Gallery. She welcomes other projects like this and is at present involved in working at the Children's Hospital in Bristol working on a slowly evolving project for a piece of land adjacent to the play area involving the children's work often with their parent or carer as well. This is part of the Wallace and Gromit appeal.